Members of Captain Cook Cruises Fiji and Cure Kids Fiji. Captain Cook Cruises Fiji has partnered with Cure Kids Fiji in a bid to overcome urgent child health challenges to achieve significant improvements for children, their families and communities throughout the country. 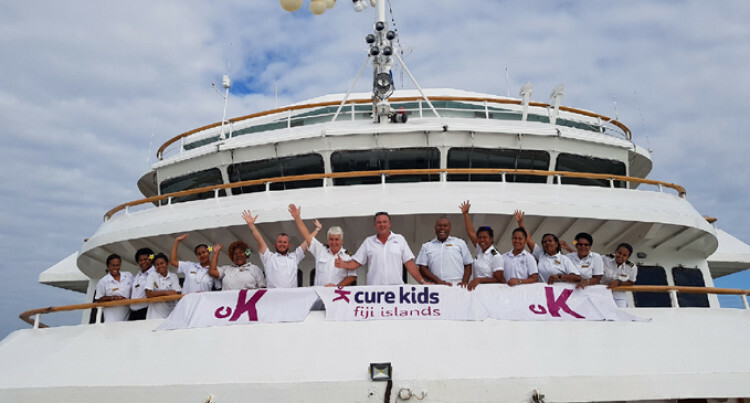 Captain Cook Cruises Fiji general manager Tony Acland said: “We are so happy to be given the opportunity to part­ner with Cure Kids Fiji and look forward to pro-actively helping improve health outcomes for Fijian children and their families. Captain Cook Cruises Fiji is supporting Cure Kids Fiji by applying a $1 per room per night charge on an opt out basis to guests on MV Reef Endeavour. 100 per cent of this donation goes directly to Cure Kids Fiji and will help save thousands of lives. The company will work with the Rheumatic Heart Dis­ease team to facilitate screening in remote Fijian villages and schools on Captain Cook Cruises trips to the Yasawa, Mamanuca and Lau Group. In addition to this, Captain Cook Cruises will support annual fundraising and charity events and help promote Cure Kids Fiji and the work they do through raising aware­ness and educating its staff, guests and the people of Fiji. Cure Kids Fiji focuses on developing life-saving solutions for these illnesses through their Rheumatic Heart Disease Control and Prevention Programme and the Fiji Oxygen Project. Cure Kids Fiji was launched in 2006 in partnership with AccorHotels and the New Zealand based charity Cure Kids, who were founded by Rotary 45 years ago. Since launching in Fiji, child health research and initiatives worth more than FJ$5 million have been delivered in partnership with the Fiji Ministry of Health and Medical Services. Rheumatic Heart Disease (RHD) affects one in 50 chil­dren, while life-threatening is a preventable condition. Fiji has the highest known rates in the world and is the leading cause of death for young people and the second most com­mon cause of death for pregnant women. In June 2014, a four-year partnership project started with the aim of preventing and reducing the impact of RHD in the Fiji Islands. In partnership with the Ministry of Health and world-leading RHD experts from Australia and New Zealand, Cure Kids is leading a national-level, research-based project, improving and building capacity across all aspects of RHD control and prevention. Each year in the country, approximately 200 children under five years-of-age die from pneumonia and newborn illnesses. Using oxygen to treat pneumonia in children re­duces death by 35 per cent. However, many health facilities in the country have unreliable or rationed oxygen sup­plies, leaving patients vulnerable.